A'ME Heated Bike Grips | OhGizmo! By Andrew Liszewski on 09/06/11 • Leave a comment! For most casual riders, the arrival of Fall, and eventually Winter, means their bikes go into storage until the temperatures warm up again. But if you use your bike for commuting to work, or are used to dealing with the elements on a ride, freezing temps probably aren’t going to stop you. Particularly if you invest in a set of these heated grips from A’ME. They easily replace the standard handlebar grips on your bike (you just slide them on and tighten a screw) but are a vast improvement since they heat up to one of 6 different temperature settings. Besides just comfort, the heated grips also improve bloodflow and dexterity in your hands when it’s freezing outside. So, you know, you can still operate your shifters and brakes. 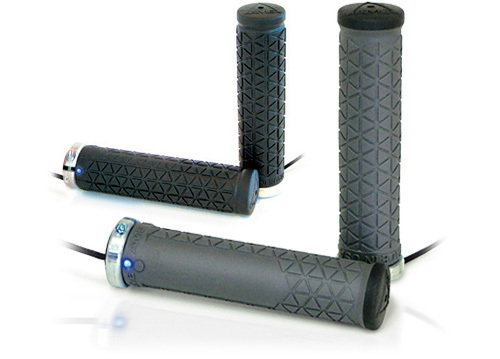 The various components to the system, including the grips, the battery pack and the charger are all sold separately. But you’re certainly better off just getting the whole setup as a kit for $199.